A view from the southwest corner of the site. Plans are moving ahead for a 140-unit housing development near the Winslow ferry terminal. 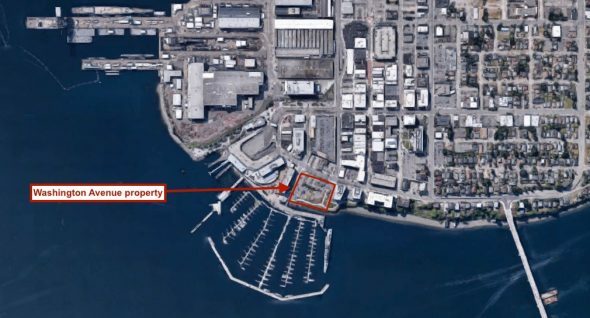 Bainbridge Landing would incorporate 115 apartments and 25 town homes on a 4.7-acre lot on Ferncliff Avenue, just north of the Harbor Square condominiums. Site plan. Click to enlarge. 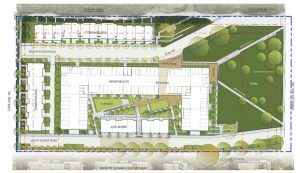 Owners have submitted subdivision and site plan review applications for the project, according to a notice published by the city Friday. Comments will be accepted for the next two weeks. 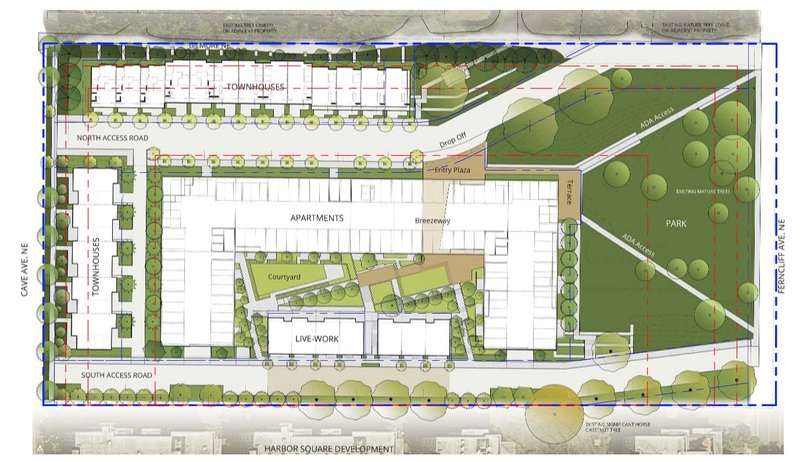 The site plan for Bainbridge Landing shows town homes and lofts surrounding a U-shaped apartment building. A portion of the project bordering Ferncliff Avenue would be set aside for a park. Olympic Property Group is spearheading the project. Charlie Wenzlau is the architect. The nonprofit Great Peninsula Conservancy is moving to a prominent downtown corner, after outgrowing its Kitsap Way digs. The land trust will slide into a corner office on the top floor of the Sound West Building at the corner of Pacific Avenue and 5th Street. Great Peninsula Conservancy is currently located at 3721 Kitsap Way. 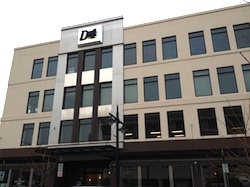 The small offices were getting cramped with a staff of five and a growing list of projects, said Executive Director Sandra Staples-Bortner. The group was interested in the exposure offered on Pacific Avenue, and liked the growing energy downtown.